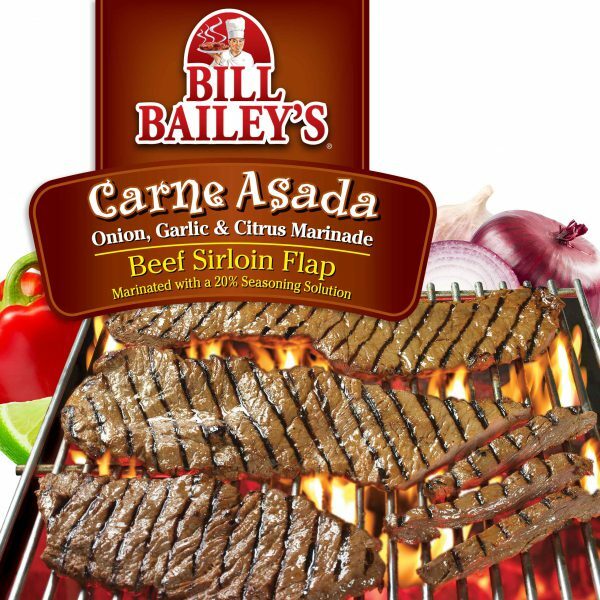 Fajitas, Tacos and Burritos are a breeze with our thinly sliced and marinated USDA Beef Sirloin Flap Steak. Onion, Garlic, Citrus and a touch of Chili Pepper give you the perfect base for so many dishes. And it’s easy to add your own peppers to turn up the heat to your individual liking. Either way, you can have a delectable meal in less than 15 minutes! Beef Sirloin, Water, with less than 2% of the following: Dehydrated Onion, Garlic Powder, Chili Pepper, Spice, Natural Flavors, Sugar, Salt, Corn Syrup Solids, Dextrose, Citric Acid, Autolyzed Yeast Extract, Sodium Phosphate, Potassium Lactate. The carne asada was good. A little disappointing on the amount of sugar it contains. This is a nice food recipe, thank you for the detailed recipe. This just OK It isn’t real Carne Asada..I grew up in San Diego and there is a distinctive flavor to Carne Asada..this doesn’t seem to have jalapenos, cilantro or Mex oregano as part of the recipe..OR cumin!! This is good but not the real deal. This tastes of citrus and salt. Sugar is NOT part of the original recipe either. Costco on Morena Blvd in San Diego used to carry some great Carne Asada and Pollo Asada. Hello Debbie, Thank you for your comments, we appreciate receiving feedback from our consumers. You are absolutely correct that our recipe does not deliver the heat that some like, in fact we even suggest adding peppers to bring the flavor and heat up to your own individual preference. Our team is continually reviewing our recipes and working towards improving them, and your input in valuable. My husband and I love Bill Bailey’s meats. Especially the Carne Asada. There is no prep and it’s so easy to grill up for a quick meal. The beef is tender and delicious. It’s perfect for fajitas or a Carne Asada bowl.